A big thank you to everyone who participated in the 2016 fashion polls – I always enjoy seeing the results! The results are in and the readers’ favorites of Kate Middleton‘s 2016 wardrobe are: the Naeem Khan blue and white dress; the Catherine Walker red coat and dress; the Roland Mouret Nansen gown in royal blue; and the Goat Binky Blouse & Banana Republic Geo Jacquard Skirt. As with my 2017 predictions poll results post, I’m going to bullet point the results of each poll in order of which entry got the most votes. Dress: Naeem Khan blue and white dress. Kate wore so many dresses in 2016 that once you get past the top five the rest were pretty close in the votes. There were even two that didn’t get any votes at all. I’m glad to see my favorite, the LK Bennett Lasa, get in the top five. Coat: Catherine Walker red coat and dress. The red Catherine Walker just inched out the light blue Catherine Walker, and I’m glad it did because the red Catherine Walker is my favorite as well – I’ve liked it since Kate first wore it in 2011 and was very happy to see it return. Gown: Roland Mouret Nansen gown in royal blue. I really liked the Roland Mouret gown and am glad to see it is so many people’s favorite. But I have to say I voted for the Tory Burch because for some reason when viewing it again I quite liked it and liked that it was different for Kate, so I’m glad that got some love, too. Separates: Goat Binky Blouse & Banana Republic Geo Jacquard Skirt. Yay! This one was my favorite, too. I love the Binky blouse and would love for Kate to wear it again. Dress: Alexander McQueen bespoke poppy print dress. I thought Kate wore a lot of dresses that were much worse than the McQueen poppy dress, but there were so many people that voiced their dislike of it when she wore that I’m not surprised that it came in as least favorite in the poll. Coat: Erdem bespoke grey coat with lace. Man, Erdem did not fair well in 2016. The top three least favorite coats from 2016 were all Erdem, with the grey lace leading the pack. I voted for the Erdem Allie as my least favorite, because I’ve disliked that coat since 2014, but it came in third behind two other Erdem creations. Gown: Saloni Blue Mary Illusion Dot Dress. I can’t remember if I voted for the Saloni or the Self Portrait gown as my least favorite, but either way those two ended up the top two least favorite gowns of 2016. Separates: Michael Kors Collection Guncheck Wool Trumpet Skirt & Virgin Wool Plaid Blazer. I’m not at all surprised to see the Michael Kors suit as the least favorite from 2016 considering it was also the least favorite of 2015. This one is just not to many people’s liking. Very interesting results. I’m happy overall with the votes. I just strongly disagree with the red Catherine Walker, it’s just all too much red for me. I like each element but all together it just gets lost in a red fog. Love that blue Roland Mouret dress just wish I was slim enough and rich enough to own it. Also love the Binky blouse and patterned skirt. Her worst accessory is the crotch clutch, and the rounded shoulders . Loose those , which are linked I think, and everything would look so. I hope better. Thanks for this KMR we do all love a good Poll. How many people voted? I think the all-red outfit would have worked if Kate didn’t color coordinate so often. It just seems like her everyday outfit but excessive. I like the Roland Mouret too, but the Tory Burch gown is my favorite (I say this on every post about Kate’s clothes but I can’t help it, I love that dress). The red Catherine walker was one of the few times I didn’t mind Kate’s monochromatic look. I think it was the total look. She had her hair back, could see jewelry and I 💜The shoes. My one complaint about that day is I believe all the other ladies were wearing cream or muted colors and she shows up in head-to-toe red. So on any other day would give her full marks. I want so much to be positive about kate, but it’s so hard when she seems so disengaged and workshy. I pretty much agree with the survey except I’m an outlier on the grey lace Erdem coat, I love it. One thing is that every event so far this year has had a new outfit, which given her existing wardrobe is unnecessary imo. Off topic but my opinion of her is that she will not be in history books as a respected popular royal. What makes me upset is that she has been blessed with this huge platform of her’s that most people can dream about and do amazing humanitarian work and influence good around the world but doesn’t want to! I’m right there with you. She has so many resources at her disposal and the world’s megaphone on her lips but, alas, she never uses said megaphone! Question: how do you think she’ll be viewed by royal historians in years to come? Do you think she’ll be judged as harshly as Fergie or kind of glossed over like Princess Margaret? We know she she’s not a workhorse like Princess Anne nor does share Diana’s charm or sensitivity (sorry but it’s true). Even Sophie (after a few rough years) started to go out and do the work with ease and the human touch. Kate shows up but she’s just…..there. P.S. I only sound cranky because I got very little sleep (my own fault). Anyhoo, TGIF everyone!! Kimberly, I honestly think it will get worse especially if Harry married a charismatic, strong work ethic, popular woman which the media loves. Kate is going to go downhill. Yes, I agree it’s going to go downhill and, in a way, it already has hence the unphotoshopped pictures that have been published. I feel the same way. Although it’s important to remember that it really is up to her and William to decide the specifics of how her role will unfold, the fact that she doesn’t get out there consistently with a handful of powerful messages does somehow leave many of us wanting more. We want her to use her highly unusual platform for “more”. Because she lacks a strong message we seem to devolve into over-analysis of her appearance, and how she spends her time. The fact is, I don’t think any of us “needs” to see her work a certain number of hours, or hit a certain number of appearances (although both appear to be on the light side) if she were taking steps to actually contribute some clear, consistent PR to her causes. We have yet to see her speak passionately, credibly, and consistently about anything. Unfortunately for her own PR machine, modern society expects more from a 35-year old person with a world stage. I don’t think she lacks time or intellect. I think this is simply the low-profile role she and her husband would prefer. Which is unfortunate considering who they are. I think Karen she thought being a royal was to live in luxury and got smacked in the face when she was told she had to work. I remember the comments from the days she wore the red poppy dress and the blue dot dress. It bothered a lot of people that the seams didn’t line up on both dresses. 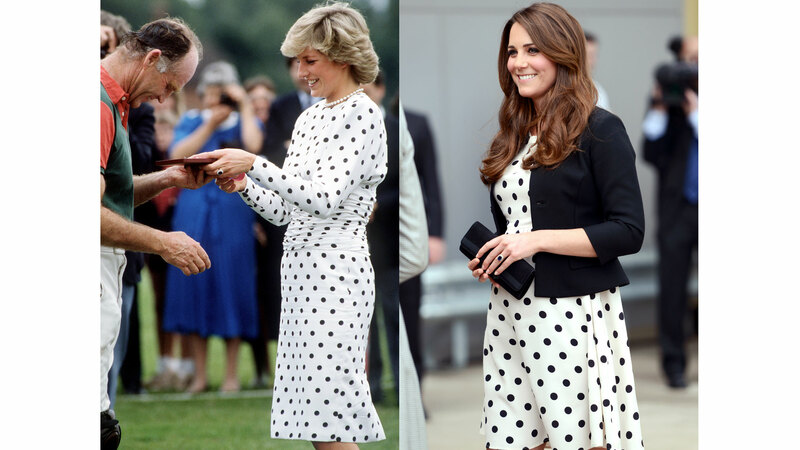 I compared those dresses to some prints Diana wore to make sure I’m not a hypocrite. Look at these photos of Diana wearing prints. In the first, the hem print aligns perfectly with the top section. In the second, the seams don’t line up perfectly, but are in the back so they aren’t as obvious as Kate with her side-seam dresses. In the third image, Diana’s side seams don’t align, but are pretty close. I’m not sure why, but they stand out to me more on Kate’s dresses and thus bother me more. It baffles me why she does bespoke then lets her team do their shabby alterations. I don’t know if you can even call it bespoke at that point. I don’t know if it’s tash or someone else but they are no seamstress. The poopy dress I believe was originally sleeveless. The added sleeves didn’t help, made it too much poppy and too dowdy. Oh never mind the dress look at Diana’s face in the first photo and how she is touching the hand of the person she is meeting. She is standing so close and seems so engaged. I know she wasn’t a saint but everyone I have spoken to who has met her said she was warm, funny and tactile. She was a special woman no matter the negative things that people say about her. Millions didn’t love her because of fawning media treatment; they loved her from pictures and personal experience meeting her where she was genuinely interested and caring for others. I would be happy for Kate to come at “royaling” completely different than Diana if she brought individual personality, but I think the best Kate will ever do is smile and wave, which puts a spotlight on foot in mouth moments like just happened. When there’s little to praise, it’s easy to critique especially with foolish comments that she makes from time to time. It really puts the burden on Will to be the star (as I’m sure the point always was to be so as to be unlike Diana’s supposed grabbing of the media spotlight from Charles). Like that was the reason the marriage failed– I don’t think so. I’m glad the poppy dress is under the least favorite category because, while the symbolism and meaning is lovely, the pattern/design of this dress is not. The “Binky” (I swear, that name it reminds me of a Teletubby) blouse and Banana Republic skirt looked great on her and was definitely a favorite of mine. Professional but still “girly” and flattering. I love these polls. It’s interesting to see how everyone voted. The Naeem Khan is so beautiful. Some of the others not so much. For me, it’s about fit, styling, tailloring and proportion. She needs a good stylist. New hairdresser. I appreciate your work on this, KMR! I agree Rhiannon! Most of Kate’s clothes are pretty nice but, as I’ve said before, it’s the styling, fit and Kate’s demeanor and posture that really throws the whole look off. Sometimes I wonder over to the pro-Kate sites and the glowing descriptions of her, her confidence and her fashion has, at times, made me wonder if we are looking at the same pictures. I am not criticizing those sites or their readers but just find it interesting how people can look at the same photo and see two different things. Her demeanor is a big part of it. The high collars and necklines, the crotch clutching and the slouching make her look uncomfortable and a little defensive. Her manic smiles can’t distract from her clothes and body language, which often seem to say “I wish I was anywhere but here”. I agree, apparently we respond to body language so viscerally which is why it is so hard to fool people. Kate leaks so much awkwardness and entitlement with her body language. Oh my. I do like the skirt and blouse that won the separates poll, but I really dislike it on her. It really points up the long torso and short legs to me. But I do like that blouse and skirt — just not on her. It’s a lovely outfit, but it doesn’t fit her – it’s too big. She swims in it. I recall at the time Kate was moving the skirt around as it was moving around/ not sitting as she wished. Off topic, but I almost fainted when I read that KP announced both W & K will be attending the BAFTA’s. I know this is not what us regular folks consider work, but it is clear the pressure is on them to step it up. The worst thing about the red poppy dress is her terrible posture, she resembles an elderly person with that posture! If she could refrain from wearing such high heels she would not have to bend down to speak to shorter people and would in turn improve her posture. Super high heels should only be worn to evening events like the upcoming BAFTAs. 2016 was when she came back in fashion.There were misses but for me the hits outnumbered the misses. However the thing is that all of my favourite looks are overwhelmingly repeats. Outside of repeats I liked the Chloe dress,the two Alice Temperely outfits in India,the LK Bennett worn at the party with kids at the Natural History Museum,the Naeem Khan and the emerald D&G in Canada.